Wednesday's mood pattern highlighted the irrational, and if there's such a thing as a breakout of irrationality, today should have been it. 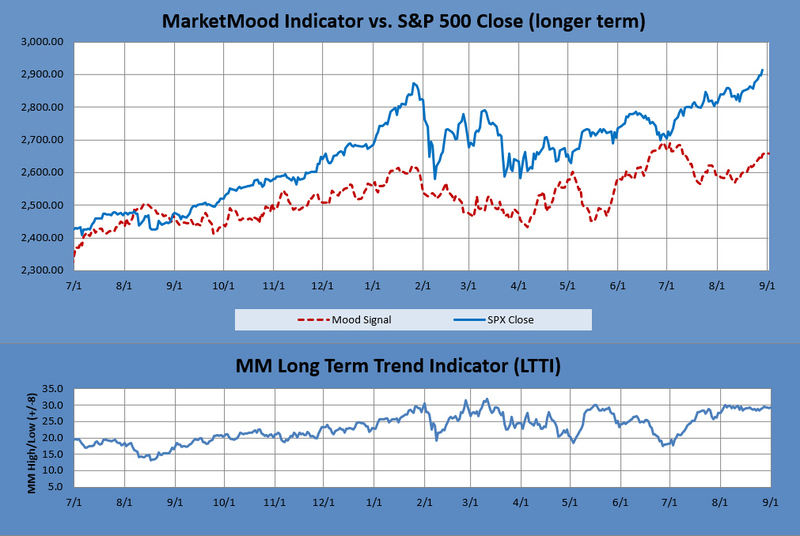 Our Market Mood Indicator (MMI) gave a slight edge for the upside on Wednesday, with the primary expectation from the mood pattern being either a breakout or breakdown (so slight edge to the breakout). The S&P 500 closed up 0.57%. Thursday's pattern implies government related concerns or geopolitical turmoil prior to a signal flip from down to up. That means downside is expected overnight and /or early tomorrow prior to further upside. However, bulls should not be complacent here. Friday's MMI is calculated as close up; however, a Thursday-Friday bearish "New Paradigm" mood pattern should come into play by sometime Friday and continue into the weekend. Overall, the next couple of days could be really tricky to navigate with surprise moves and whipsaw likely. The primary outlook is that a corrective move is in progress. Weekly charts are looking for a near term top or pause. Monthly charts show (roughly) August as a high and October as a low. MM MACD signal is BUY and the intermediate trend is UP. The swing trade signal is continued buy at or above 2918 SPX.